We made it through the halfway point in the work week! We are getting close to another weekend! If you've been following me awhile you know I'm not a fan of Valentine's Day. But I thought I'd go ahead and do one look for Valentine's Day this week. I've been wanting to do this mani for awhile and this was the perfect opportunity! 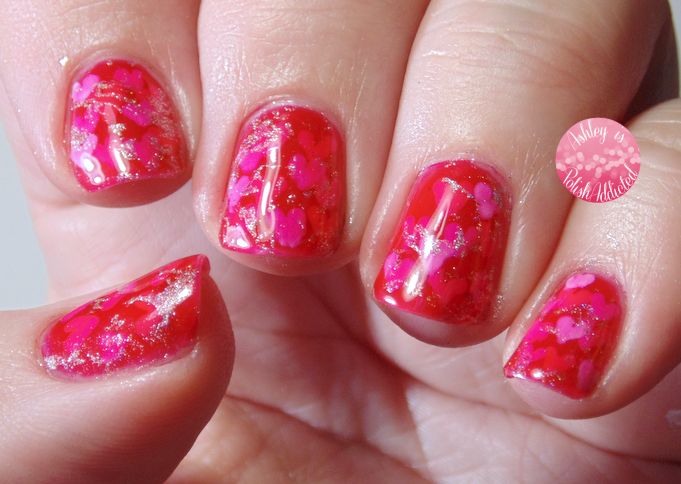 My friend Jacki over at Adventures in Acetone did this mani nearly 2 years ago and, while I have done several pond manicures, I never have attempted the freehand hearts in between the layers. 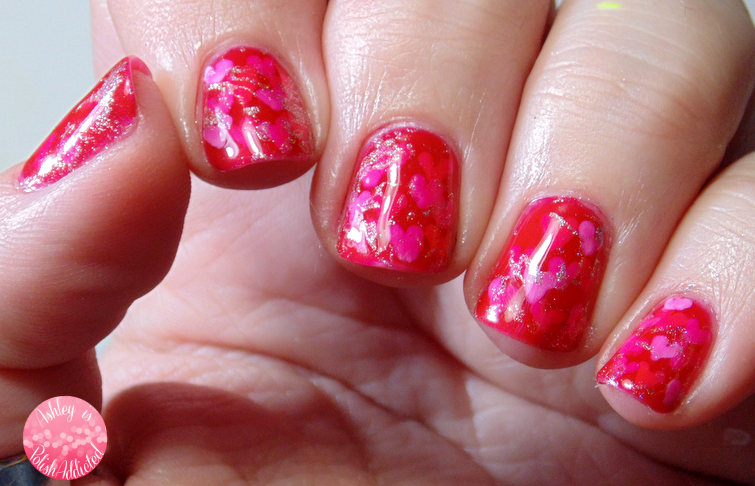 I used a red jelly (L'Oreal Jolly Lolly) that I bought from a blog sale a few months ago specifically for pond manis. After doing multiple layers of jelly and hearts (which were done with a plain white creme polish) I added a coat of topcoat and let it dry completely. I then used the spray marble technique with Elevation Polish Silver Sword to add some delicate sparkle over the top. 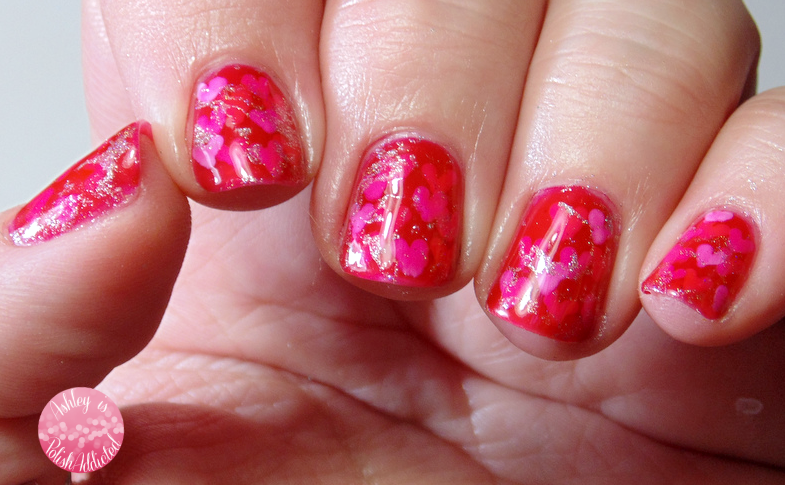 I love the added effect of the spray marble over the pond mani! I wish my photos were better. This one was so shiny it was hard to capture! Loving the pond effect, especially with the sparkle. Perfect! Both techniques are wonderful! Is the spray effect water spotting? I love pond manis. And the colors on this one are amazing! I haven't nailed the pond mani yet! This looks great though! Great techniques! Your manicure turned out so beautiful! Love pond manis! And the spray marble adds the perfect bit of sparkle. So sweet and pretty! That hint of sparkle is perfect! You've combined 2 of my favorite techniques and i LOVE how they worked together! These are so pretty! The metallic touches popping through are just gorgeous! I still haven't done a pond mani, but you inspire me to try! I love pond manis and I love this one! Super duper cute!